Pascal was born on June 19, 1623, in Clermont­ Ferrand, France, the son of noted mathematician Étienne Pascal, who provided most of the boy’s education. His mother died when he was four, and his sisters, who were devoutly religious, had a strong influence on his upbringing. The family adhered to Jansenism, a strict reformist movement of the Roman Catholic Church (which condemned it), and religion played a significant role throughout Pascal’s life. At age 19 he devised the first digital calculating machine to help his father, who had been appointed tax collector of Rouen in 1640. The instrument consisted of a series of connected wheels inscribed with numbers one through 10; the first wheel’s numbers represented units, the second wheel’s numbers represented tens, and so on. He built about 50 machines, and a standard model was in production by 1652. It made Pascal famous, but it was not a commercial success. In 1648 Pascal tested the theory behind EVANGELISTA TORRICELLI’s mercury­ column barometer, invented five years earlier. He enlisted his brother­ in­ law to take a mercury column up a mountain to an altitude of 1,200 meters. The air pressure is lower at the top of a mountain than at sea level, and the mercury height dropped. This confirmed Torricelli’s proposition that atmospheric pressure regulates the height of the mercury column. The same year Pascal completed experiments that yielded a universal physical principle of fluid (now Pascal’s Law), stating that when pressure is exerted on a confined liquid, the pressure is constant in all directions. About 1654 Pascal and mathematician PIERRE DE FERMAT developed the mathematics of probabilities and combinatorial analysis. Pascal was the first to use the “Pascal triangle” (the triangular arrangement of the coefficients of successive integral powers of a binomial) for calculating probabilities. In 1655, on the heels of two profound religious experiences, Pascal entered a Jansenist retreat where one of his sisters was a nun. His health had been weak since his youth; he died at age 39 on August 19, 1662, in Paris. His philosophical treatise, Pensées (“Thoughts”) appeared in 1663. Pascal’s scientific legacy consists of his accomplishments in geometry and probability, his explanation of barometric pressure changes, and his successful experiments with pressure and fluids. 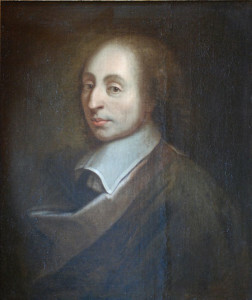 Portions of Pascal’s work in geometry were influential in the formulation of differential and integral calculus, which was consolidated in the eighteenth century and which served as the basis for much subsequent progress in mathematics and physics. Combinatorial analysis, co­founded by Pascal, was crucial to the development of the mathematics involved in computers in the twentieth century. The modern computer language Pascal is a testament to this seventeenth ­century contribution. When Pascal’s brother ­ in­ law took a mercury column up a mountain, he not only demonstrated that air pressure is responsible for the height of the mercury column, but also confirmed that air pressure decreases with increasing altitude. This showed that the atmosphere has a finite height, and when it was understood that air becomes less dense with increasing altitude, the concept that “outer space” is a vacuum took hold. Pascal’s Law established the field of hydrostatics, a branch of physics dealing with the properties of fluids, especially in relation to pressure dynamics. The invention of hydraulic devices, which use liquid under pressure to apply force emerged directly from the development of this field, yielding the hydraulic press, the hydraulic jack, and automobile brakes.